Meissen Porcelain Blue Crossed Swords Saucer Bowl Dish Pot Vase Candlestick Cup Jug Plates Urn Bonbonnière Coffee Service Figurine Plaque Sucrier Tankard Tea Set. Just a small selection of similar items our experts value on a daily basis. 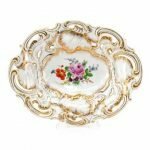 Antique Meissen Gilt Hand Painted Porcelain Pierced Bowl. Cancellation marks on blue crossed sword mark. 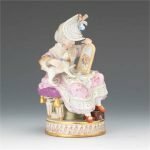 Porcelain figurine of a girl with a dog on her lap, seated on a cushion, holding a mirror on her lap for the dog to see its reflection. Hand painted with areas in gilt, incised on bottom F 50, with underglaze blue crossed swords. 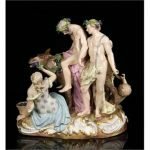 19th century German Meissen porcelain grouping, with donkey figures, 8 1/4″ h x 8″ w.
Continental porcelain figural group after Meissen, each depicting a rider on a goat, the base with floral accents. 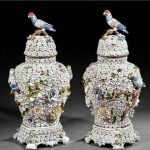 Pair of Meissen-Style Schneeballen Porcelain Covered Urns , late 19th/early 20th c., applied polychrome birds and flowers, gilt decoration, scrolled feet. 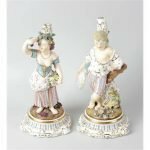 A pair of Meissen figural candlesticks. Modelled as two of the Four Seasons, she with vine headdress and holding grapes, he with wheatsheaf beside a skep, underglaze blue crossed sword marks. 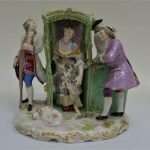 Meissen porcelain figure, the polychrome painted figure of a lady on a gilt C scroll base, cross swords to the base. 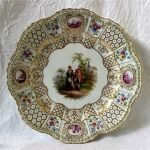 A 19th century Meissen porcelain plate with a raised moulded border with honeycomb pattern vignettes of castles and shipping, with bands of raised flowers, the centre painted with a couple walking in a garden, underglaze blue crossed swords to the base. 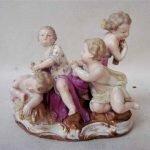 19th century Meissen figural group representing Summer, four cherubs with sheaves of corn on a naturalistic oval base, blue cross swords. 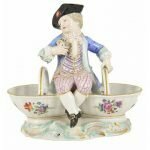 A 19th Century Meissen figures group in the form of a male figure carrying a Sudan chair. 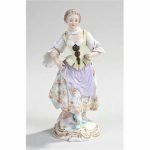 A Meissen porcelain figural basket salts, late 19th/early 20th century a young man seated centrally holding a bouquet of flowers upon two floral painted baskets with rope twist handles upon a rococo scrolled base, blue crossed swords to base. 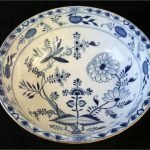 19th century Meissen wash bowl with everted gilt rim, blue & white decorated with the “Onion” pattern, blue crossed swords mark. 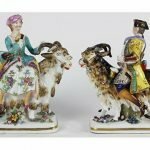 Antique Meissen Porcelain Values Online Valuations Authentication & Appraisals Prices – How much is it worth?